Childhood dreams of zipping around in a jet pack no longer have to haunt you as unreachable. 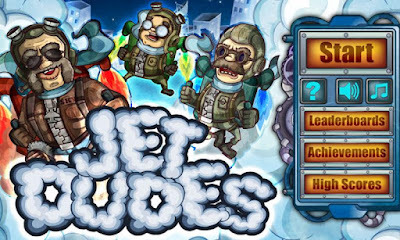 With the Jet Dudes app for android you can fulfill those lifelong dreams and have the time of your life! You are a jet pack pilot zipping around the wild blue, but your dream world is not unencumbered. A variety of enemies try to spoil your good time. You can either avoid them or shoot them down, whichever you find the most appealing. Of course if you do not see it in time to aim you may not have a choice. If you get good enough, you can even earn bonuses. The Swarm supported leaderboards and achievements are state of the art and the only way to really ensure you are the best of the best. When you earn those achievements you know you a have done well, but when you see yourself as the global leader with the high score on the leaderboards, the whole world is seeing it as well. Make your jet pack prowess known to all by doing what it takes to stay on top. You can do it, it just takes practice, and when you download Jet Dudes you can practice whenever you have a spare minute.